A New Addition to Stargazer's Garage: Tango RV! This has been an exciting weekend for us because we just added a new member to our (virtual) garage: a 2009 Tango Travel Trailer. (Being 30-feet long, it doesn't fit in our real garage.) While the idea of getting into RVing has been with me a long time, taking it seriously and acting upon it didn't start happening until about a month ago. Since we had missed the spring RV shows, we stopped at our local RV dealership a few Saturdays ago for a look and we got a very informative and educational tour of different types of travel trailers. Our 2007 GMC Yukon XL Denali is the most tow-capable vehicle we've owned, and I wanted to see what a 7800 lb. trailer looked like. The sales person spent a lot of time showing us the entire spectrum of RVs from modern upscale to affordable entry-level. We learned about GVWR and towing limits, as well as about slides (not the ones we're used to that you find at playgrounds! ), outdoor showers, and saw that there were almost infinite variety of floor plans available. The trick was to find something that suited our large family of 5 children with room to grow and still keep within the limits of our Denali's towing capacity. The next weekend, we went out to the Langley By-pass to check out another RV place. While no salesperson was available to show us around, armed with the knowlege we gained the week before we were able to take a peek into some different trailers with different floor plans and make comparisons with what we liked and didn't like. We even got to explore the massive Class-A tour-bus-syle RVs and dream a little. In that particular area of Langley, there is a cluster of RV dealers side-by-side and across from each other so in between dropping off and picking up our kids at various birthday parties we went back and visited 3 more RV places looking at even more trailers. 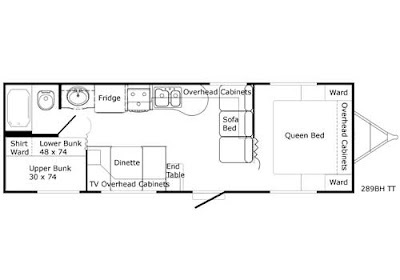 While every single trailer we looked had the same basic features like a queen bed, dinette, kitchen, sofa bed, bathroom and bunks, each one also had unique way of arranging everything within the 26' to 32' lengths that we looked at. We even saw one with a triple-bunk. I thought it was quite coffin-like myself, but I imagine the kids would have loved something like that! By the time this weekend came, I was almost RV'd out. I thought we would just leave it for awhile and think about tow limits and cargo capacities and sleeping arrangements... But Saturday morning after picking up one of our girls from a birthday party a Koko's in Port Moody, we drove by Coquitlam Center and saw they had an event with mulitple dealers displaying, cars, motorcycles, boats, and RVs. We just had to stop. So now you can see the result. It's the end of the weekend and we spent our Sunday afternoon borrowing books about RVing for beginners and idiots like ourselves and taking measurements of every overhead cabinet trying to plan how we would be filling up and personalizing our very own portable hotel room. I'll explain why we chose this Tango 289BH Travel Trailer by Pacific Coach Works over all the others in my next post. 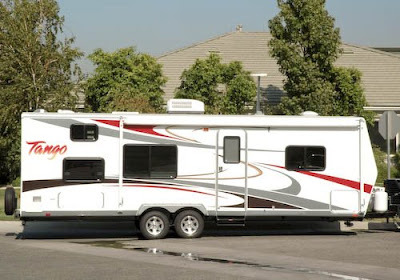 Having never ever pulled a trailer, let alone something this big, it's going to be quite an adventure this summer as we learn about the world of RV vacationing. There definitely will not be any "staycation" for us this summer because we're going to try to hit the road as often as we can while my wife and I both have this summer off. But before we go anywhere, I'm going to have to learn how to get this rig on the road without running over any small animals, shrubs, or light posts. I'll definitely keep track of my progress online. Wish me luck! Wangos! Where are you going to park while at home? How was it going up Johnson towing the RV? Oh yeah, can't wait until I see it in person! The specs says it sleeps 9?! Even if the sofa pulls out into a bed I can only see sleeping 6 adults? It will barely fit on the driveway, but we're going to have to store it somewhere else. We haven't finalized all the paper-work yet. There will be a lot for me to learn before I can think of parking it on the driveway! These are the sleeping arrangements: 2 on the queen bed, 1 on the top bunk, 2 on the double-bunk, 2 on the dinette convertable, 2 on the sofa-bed equals a total of 9. Realistically, I can imagine 1 adult on the sofa, and 1 adult on the dinette so a total of 7 adults--which should be room enough for us as the kids grow up.